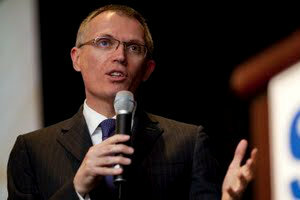 Following a rebuff by both General Motors and Ford of his expressed desire to head up either company, Renault COO Carlos Tavares tells Autoblopnik he would be willing to take over as the Easter Bunny if the job was offered to him. Tavares said he thinks he would actually be best suited to take the position of Santa Claus, but he did not think this position was likely to open up. Tavares said he hasn’t actually spoken to anyone involved in Easter management about his desire for the position, but he felt positive that putting the word out via a major news venue like Autoblopnik would do the trick. Jesus Christ, chairman and head of public relations for Christianity, said that Tavares had not reached out to the religion directly, and that they were not looking to replace the Easter Bunny any time in the near future. “This is primarily a family business, and we prefer to promote from within,” He said.